TENNIS4ALL - throughout the year - for all ages and abilities! For ADULTS - and for JUNIORS. Throughout the whole year, Adults & Juniors-with-Passports are encouraged to come along to the Adult Club Tennis Sessions, which take place on Tuesdays (6.30pm-8pm), Fridays (Rookie Night: 6.30pm-8pm) and Sunday mornings (10.30-12.30pm) . Balls and partners are provided. The perfect way to meet fellow members. Simply come along - no need to book! ROOKIE NIGHTS (Friendly Fridays) are particularly suitable for those adults wanting to build up a bit of confidence - and our Head Coach Alan Elbourn will always be there to lend a helping hand! JUNIOR CLUB TENNIS: In the Summer months there is also Junior Club Tennis ( 12-16 yrs) on Thursdays, from 6.30pm-8pm. Again - all 12-16yr juniors are encouraged to come along! Balls and partners are provided. COACHING: Our four coaches provide a huge variety of coaching options for all ages and abilities. See the COACHING PAGE for more details. MENS MIDWEEK: Interested in playing mens doubles 10.30am-12.30pm - typically Tuesdays & Thursdays? Contact Steve Perry. MATCHES: At weekends, it’s highly likely that courts three and four will be used for matches against visiting teams. See link at bottom of page to full summer match schedule and Court Planner for more details. Interested in playing for the Club? Get in touch with one of the captains! CASUAL PLAY: At ALL times, members can ALSO use the courts for casual play. Always sensible to check court availability and even better to BOOK your court - or you might get thrown off! MATCH PLAY: From 7pm onwards on Mondays (ladies) and Wednesdays (men) the captains invite their team members to hone their skills against one another. Get in touch with one of the captains! if you're interested in playing for a team. SOCIAL SINGLES: Fancy a spot of friendly singles now and then? 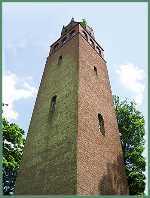 Well - so do the members(malle & female) listed HERE! Why not add your name to the list - and arrange the game between yourselves? TOURNAMENT PLAY: Faringdon Championships - May-September. Matches can be played at any time that there is court availability; including Tennis Tuesdays, Junior Thursdays, Friendly Fridays, Match Sat/Sundays. Please note however that on Social Sundays ( 10.30-12.30pm) DOUBLES always takes precedence over SINGLES . In other words, Social Doubles outrank Tournament Singles! 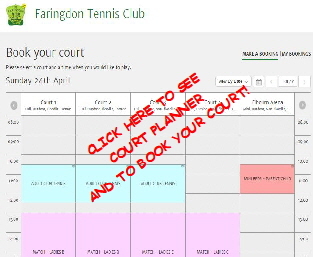 Click HERE to see the COURT PLANNER - AND TO BOOK YOUR COURT. Court ONE is the court closest to the Clubhouse. Courts ONE & TWO are the two floodlit courts. Matches take place normally on courts THREE and FOUR. And unless there are two home matches at the same time, there will always be one court available that you can book for casual play during daylight hours - unless it’s already been booked by someone else. For casual play, you can either take pot luck and simply come down to the club (a good idea to check court availability first!) - or you can BOOK any of the four courts (daytime or evening) whenever they’re shown as available - if you wish to do so. Weekend matches usually start at 1pm; and you’re usually home by 5pm. If you’re interested in playing for a team, please do contact the relevant captain and let her/him know. See CLUB CONTACTS.